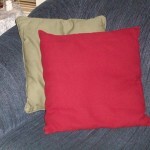 I decided on the color I wanted to add which was red. I shopped around for bargains and found several. At Cracker Barrel, I found a $20 red silk flower arrangement on clearance for $5. 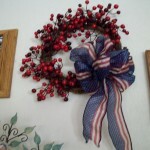 Also at Pottery Barn, I found a red cranberry wreath half price and bought ribbon at a craft store to make a bow for it. At a Kirkland’s store in the mall, we found two small framed pictures with red flowers that were just perfect. And they were on clearance, too, for a great price. Other stores that would be great to check out would be Target’s clearance section, Ross Stores, T. J. Maxx, Tuesday Morning, clearance items at Dillard’s or any major department store, and possibly Burlington Coat Factory’s home section. This entry was posted in Household Ideas, Saving $/Coupons and tagged color accents, frugal ideas for redecorating, pottery barn by Charla. Bookmark the permalink. If you wish to have some instant change implemented to your house then rearranging the furnitures alone won’t do, providing a completely different look will sound to be a better option and adding some flowers will be of a very good importance to have this implemented in an effective manner. 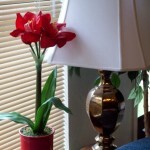 Every flower has a different meaning and thus the flowers in the house will just improve the positivity in the house.